This Trinidad Paradox Robusto was the first cigar from a freshly opened box and my first experience of smoking a Trinidad cigar. I took the picture right inside the store since I wanted to make review notes on the drive home. 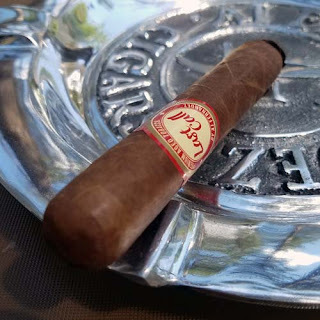 The cigar was box-pressed, it had a nice nearly square shape, and the seamless wrapper was nearly vein free. After several attempts, I came to the conclusion that the aroma from the foot was a mild barn yard scent. Once the cap was cut the flavor from the free cold draw confirmed the barnyard aroma. After the cigar was burning it produced a nice volume of smoke but, the initial flavor notes were not at all what I expected. I found notes of wheat straw, oak and fresh cut grass--not my ideal flavor mix at all. However, these flavors quickly passed and were replaced with a semi complex flavor mix of toast, sugar, molasses, sweet cream, semi-sweet chocolate, walnuts, charcoal and spicy cedar. Like I said, the flavor mix started out a bit shaky for me, but in the end I thought the Paradox was a very good medium bodied cigar. It had a razor sharp burn, a long ash, hanging on until the mid point, good overall flavors and the box pressed shape held until the nub. These flavors at this price point make this cigar a winner for me and I will be smoking more.